​Communities of practice are self-organising and self-managing groups of people who share a passion for the common domain of what they do and strive to become better practitioners. They pursue a shared learning agenda and create value for their members and stakeholders through developing and spreading new knowledge, practices, and capabilities. 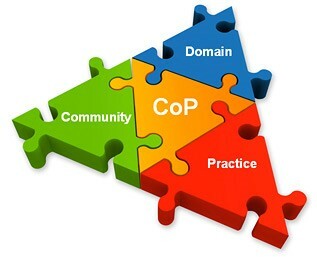 It is the shared domain that gives the community its identity. Participation is voluntary not delegated but can be linked strongly to a job role or project. Members are practicing in the field not “interested in” or “fans of “. This does not mean that Communities cannot be inclusive. Some Communities are strengthened by including customers or people with lived experience of an issue of problem that the community works to address. Communities develop shared resources, stories about their experience, tools, tips and tricks to overcome common problems, ways of practicing that the community believes deliver the best results. Communities are all about relationships and developing a trusting environment where members can share their knowledge and experiences, discuss their success and failures and learn together. Communities members work together in the same team or organisation but often connect across wide geographies and organisational boundaries with the intention of sharing and learning. ​Communities of Practice are excellent at building relationships that can foster trust and deep learning allowing members to sense make and reconnect with their values and aspirations in environments where this has sometimes become difficult. When organised intentionally into a network and facilitated to encourage Communities to see each other the value generated can be even more powerful. Connections between communities can encourage the innovative and problem solving potential of Communities to flourish generating innovative solutions and building large scale systems change. We have collaborated successfully to build a number of networks and communities. It's important to build your community and network intentionally and design it to create the value its membership and wider environment require. Contact us to arrange a free no obligation conversation.